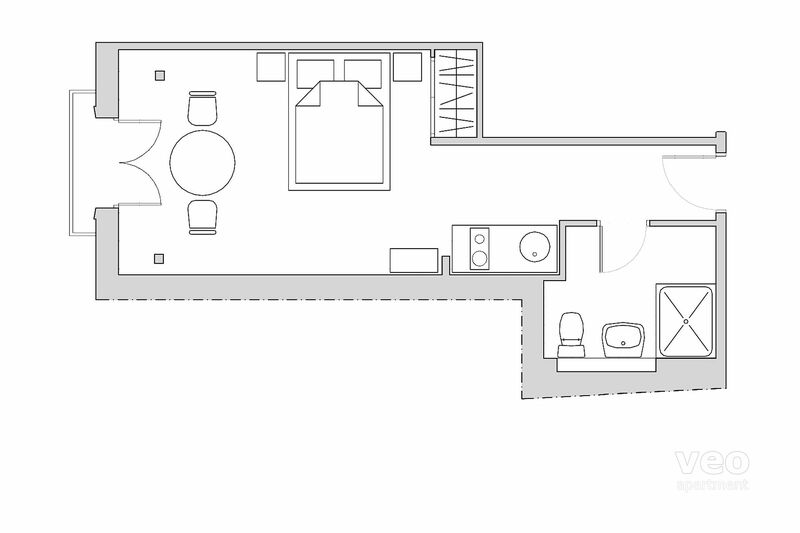 Brandneues einladendes Studio-Apartment bietet ein Doppelbett, einen Esstisch und eine kleine offene Küche, mit allem Notwendigen zur Zubereitung Ihrer eigenen Mahlzeiten. 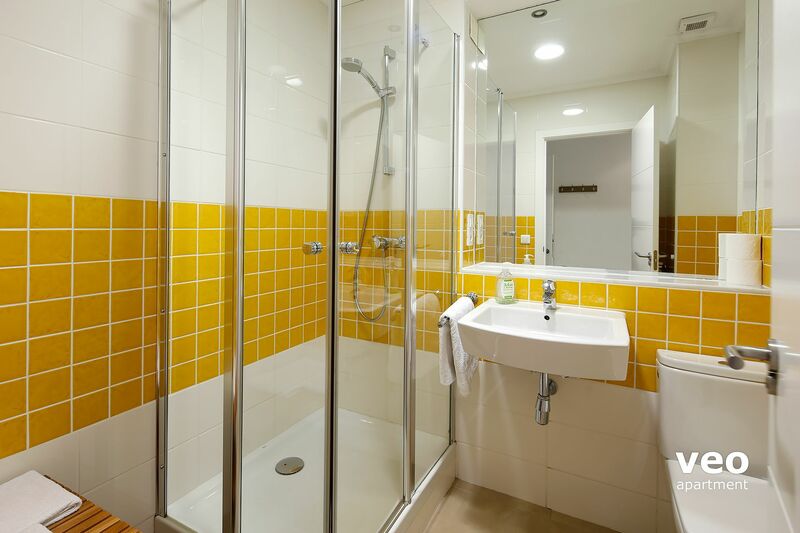 Badezimmer komplett mit Toilette, Waschbecken und Dusche. Durch das große Doppelfenster dringt eine Menge Licht und Luft in die Wohnung. Fernseher mit Flachbildschirm und kostenlose W-Lan-Internetverbindung inbegriffen. Topmodern eingerichtete Unterkunft ideal für Paare und kurze oder mittlere Aufenthaltsdauern. Ihre zentrale Lage in der Feria Straße, in nächster Nähe zur Alameda de Hércules und 15 Gehminuten von der Kathedrale entfernt, macht sie zum idealen Ausgangspunkt für Ihre Stadterkundung in Sevilla. "Lovely apartment in great location." Modern studio apartment. 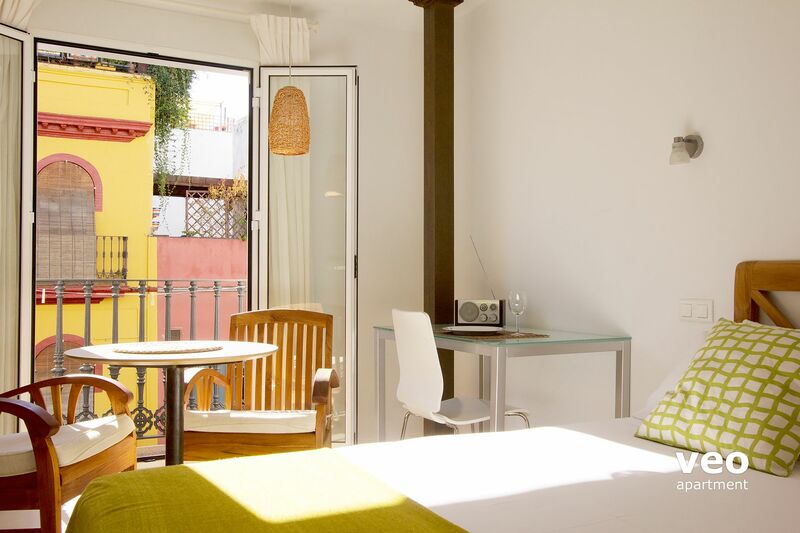 Good location close to lots of tapas bars, restaurants, bakeries, shops, historic churches and monuments. Cental and very pleasant. We will come again. Studio clair, insonorisé, propre, bien équipé. Literie ferme et confortable, adaptée aux personnes de grandes tailles. Proximité des commerces et de la gare ferroviaire (1,5 km) appréciée. El apartamento está tal cual en las fotos. Es muy bonito y las personas que están ahí muy amables y cercanas. La situación es buena y cuenta con muchos servicios a poco metros. Ottima soluzione per la vacanza di due persone, piccolo ma funzionale. Dotato di tutti i concort, pulito e fornito di tutti i confort. 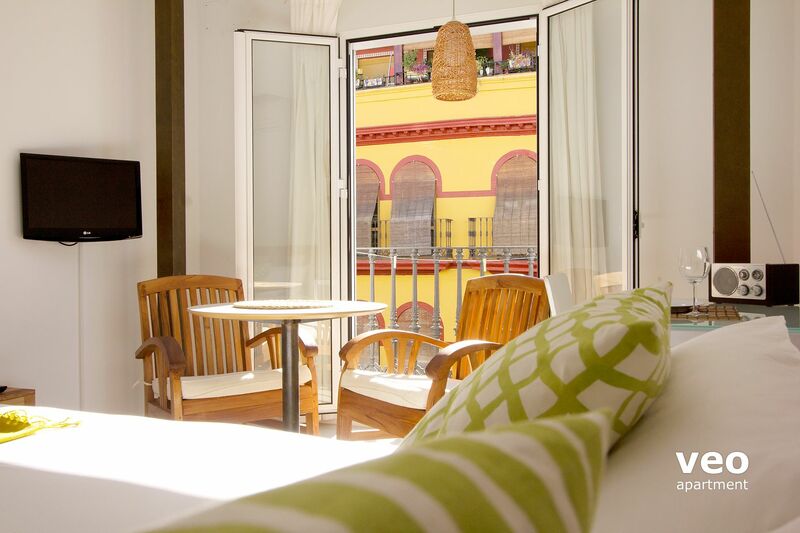 "Very comfortable stay in Sevilla"
We very much enjoyed our stay in Sevilla and at Feria 2B. 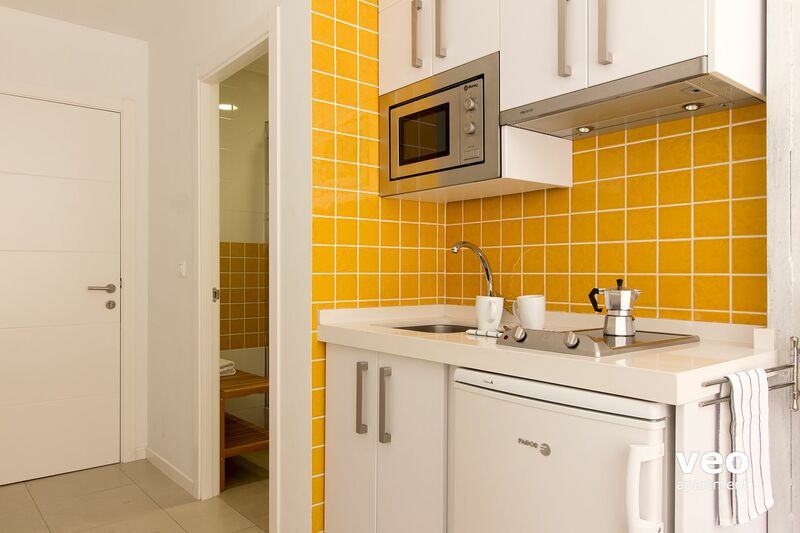 For a studio apartment, we found it to be bright, well equipped and comfortable. 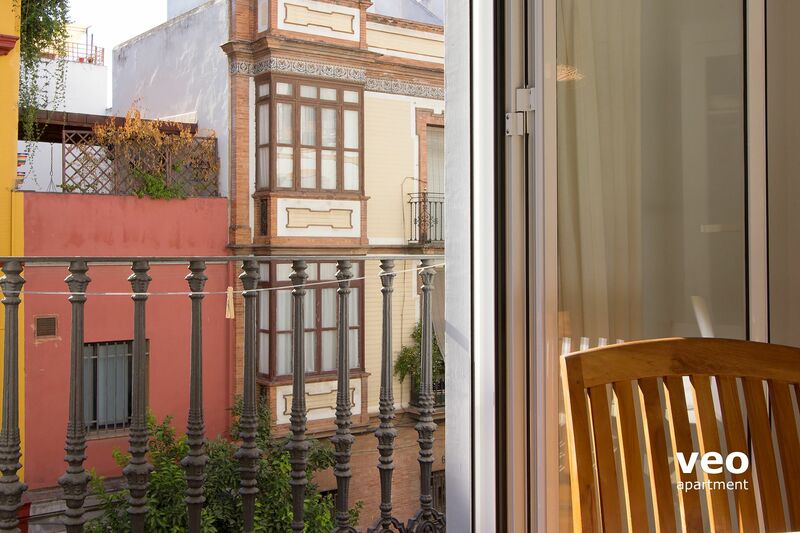 The Veoapartment team was helpful with advice on things to do in Sevilla. We would recommend Feria 2B. "Mi sono trovato molto bene." L`appartamento è piccolo ma molto funzionale. Pulito e arredi nuovi. "Très bon accueil, bonne situation, quartier vivant"
Bien équipé, très bon état. Le personnel présent est très serviable et disponible. "Immer immer wieder sehr gerne!" Saueber, alles was man braucht, alles bestens. "Clean & Spare Room in Great Location"
We were thrilled with the apartment's location - the neighborhood has a lot going on and the energy and people watching is great! The market is right next door, there are a multitude of options for meals and drinks close by, and the more 'touristy' areas of the city are easily reachable by foot within 10-15 minutes. Booking, check-in and key pickup were easy. Trash removal while we were there was simple - there are boxes just outside the building. The room felt smaller than the photos/floor plan online, although that could have just been my impression - it really is just one room, the size of a hotel room rather than an 'apartment'. "Ideales Studio für 2 Pers. für Städtebesuch!" + Perfekt für einen längeren Aufenthalt, allerdings nur für 1 Person. Stadtzentrum ist in ca. 15 Min. zu Fuss gut erreichbar, Buslinie praktisch vor der Haustüre, habe dies allerdings nie getestet. Div. Einkaufsmöglichkeiten für den täglichen Bedarf in nächster Nähe, sowie viele Bars und Restaurants. Im Hause sehr ruhig. "Bon rapport qualité/prix à quelques pas du centre ville." 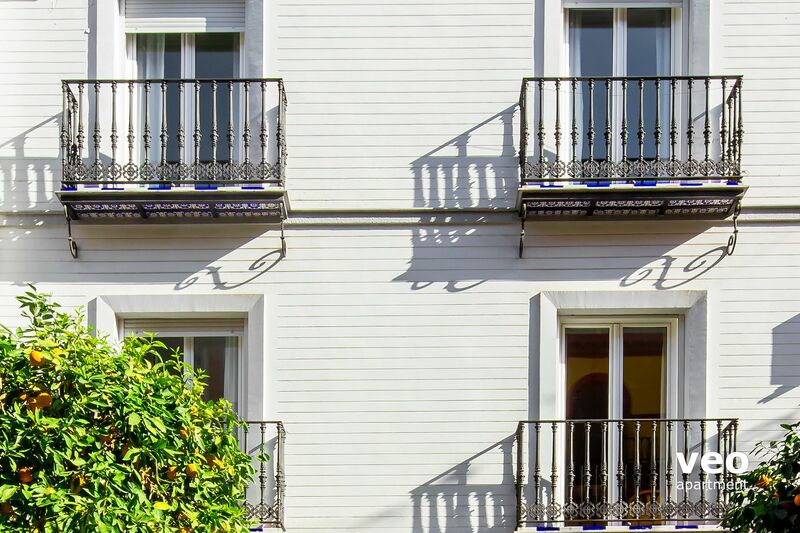 "DE NUEVO UNA ESTANCIA DE 10"
Gracias a todo el equipo de Veoapartment, como usuarios ya de varias veces, no sólo en este apartamento sino en otros ofrecidos por la web, daros las gracias de nuevo por lo bien que nos haceis sentir durante toda la estancia. El apartamento en cuestión, que deciros más de lo bien informado que lo tenéis en vuestra web y presentación del mismo. El encanto de la calle Feria, el mercado, la facilidad para acceder al centro, la comodidad del mismo, con todo lo necesario para no echar en falta nada que en casa pudiese uno tener, la cantidad de bares, supermercados, bancos, etc... que rodean la zona, lo hacen a uno sentirse en casa. Por poner una pega, que con lo bien que se encuentra uno y lo cómodo, la estancia se hace muy corta! te quedas con ganas de más. Por eso no dudéis que repetiremos gustosamente para volver a vivir más experiencias con vosotros y en nuestra calle Feria o cualquier otro rincón de Sevilla. Nuestra más sincera enhorabuena por haber creado una web de calidad, donde lo que se muestra es completamente exacto a la realidad, y los precios muy asequibles por la época que estamos pasando, y por la facilidad de uso de la misma e información completa en general. A todos, Sarai, Markus, Joao y los que no conozcamos que hacen que vuestra empresa sea digna de un 10, mil gracias por todo. "Wir kommen sehr gerne wieder / Nous revenons très volontiers!" Wir haben einen feinen Aufenthalt (Anfang März 2014) in einem sehr praktischen und gut ausgestatteten Studio in toller Lage verbracht. Sehr hilfsbereites und nettes Team. Fazit: Sehr empfehlenswert! Nous avons passé un excellent séjour (début mars 2014). Le studio est pratique, bien équipé et dans un super quartier. L'accueil était très sympa et bilingue (francais-allemand). À recommander! I felt very comfortable during my stay in Seville. This place is a perfect hideaway with good acces to public transportation. "Wonderful. Wonderful. 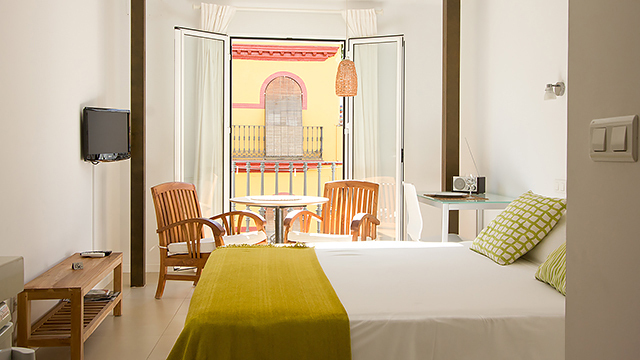 And wonderful ..."
Thank you to all the great staff who helped make our stay in Seville even better. 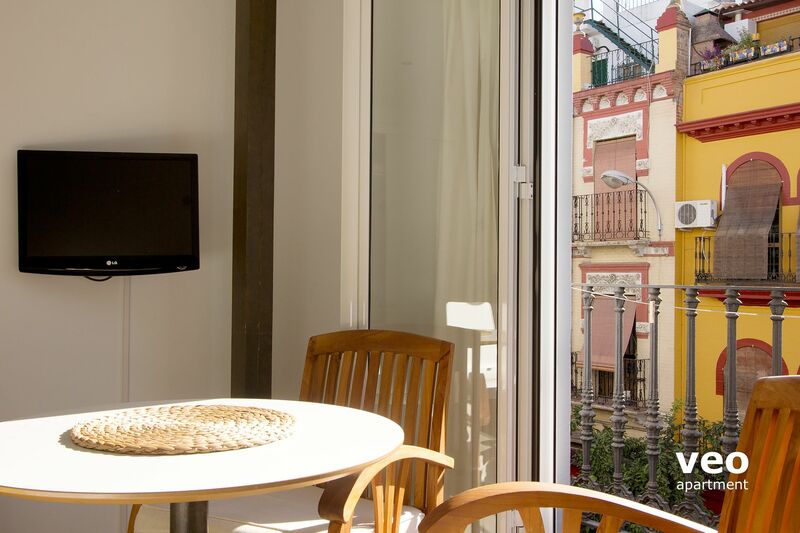 I will recommend Veo Apartments to all our friends and will absolutely book again next time I get to come back to Spain. Thank you so much. 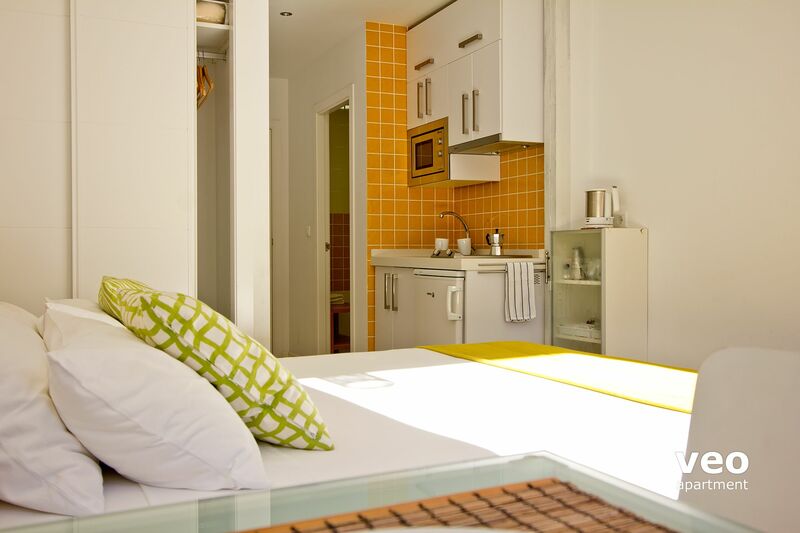 "A very enjoyable, comfortable stay in an interesting neighbourhood." Apartment Feria 2B was just as advertised. The office is just downstairs and the staff are welcoming and very helpful. The neighbourhood is interesting and around a 15 minute walk to the cathedral through lively areas full of bars and shops. I'd recommend 2B. "Nice apartment, very good location"
The apartment was very well located and equipped with everything we needed for a short stay. If we we're planning to stay longer we'd probably need a slightly bigger kitchen. "Nice location and good value for money"
Nice apartment off the beaten tourist track. Located just around the corner from Almaeda de Hercules which has loads of cafes/restaurants. Only 15 min walk to centre of Seville. Clean apartment with good airconditioning. "Idéal sur tout les points"
"Agradable, limpio, cuidado....me ha gustado"
El apartamento no diferia de las fotos vistas, todo correcto. Tuve un problema con internet i todo fueron facilidades por parte de Veoapartament. Bien situado, limpio, eso sí, dificultat de aparcar en la zona. "Excellent apartment, clean and comfortable, great location, excellent value for money and helpful service from the team at Veo - recommended!" "Our lovely home away from home!" The apartment was clean and comfortable, great value for money. 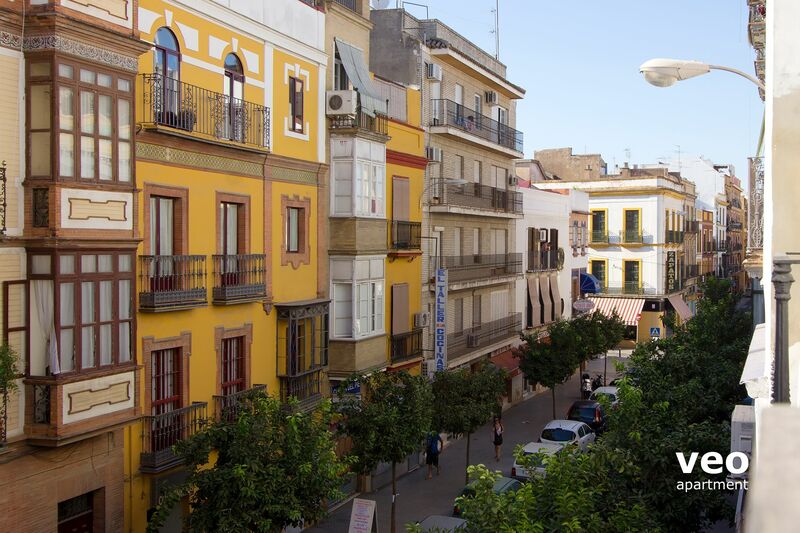 We loved the area, we spent a lot of time wandering around Sevilla but found that exploring La Macarena area our favorite experience. The staff were incredibly helpful. es gab nichts auszusetzen und wir waren sehr zufrieden. super sauber!! "Stilvolle Einrichtung, sehr guter Schnitt und Lage"
Sehr gut. Einziges Manko, es hätte etwas größer sein können, aber trotzdem sehr gutes Preis/Leistungsverhältnis. I was busy for the last couple of days and just today I´m back to my routine life in Bombay. especially on the supermarkets, Feria open market, etc as well as the instructions to use the stove, washing machine, etc. was useful. 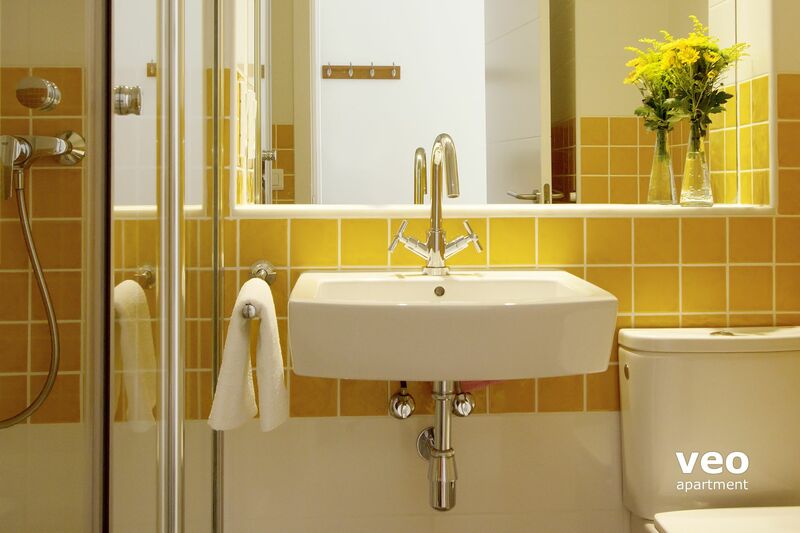 maybe you could have a full length dressing mirror in the passage (on the wall opposite the bathroom door) as well as a focus mirror in the bathroom. You see, the only mirror in the apartment was inside the bathroom. After dressing, one doesn´t prefer usually to step inside the bathroom to brush your hair. Again, the focus mirror inside the bathroom would help guys for shaving and ladies for their make-up. 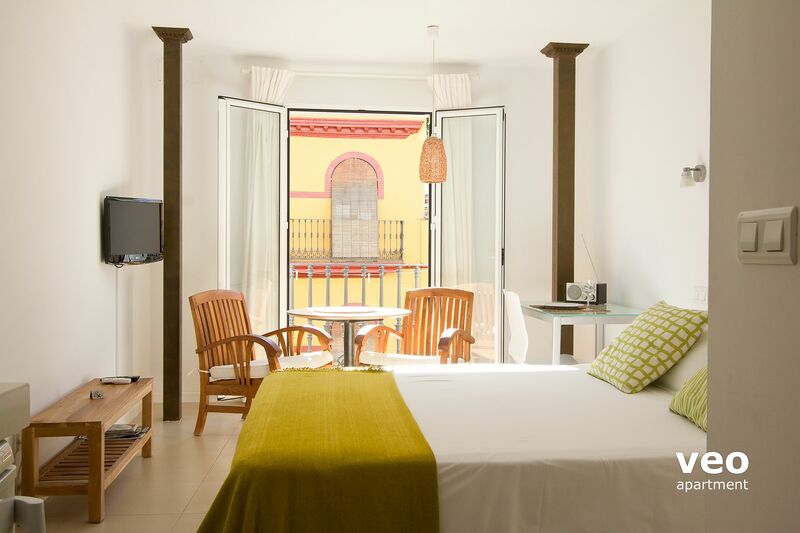 thanks to a comfortable stay at Feria 2B!!! "Perfect little weekend pad, well thought out in a desirable location excellent value for money and very friendly staff "
"Well-managed, new, clean, chic, affordable studio apartment with 4 star amenities." Love the apartment and everything inside. It feels like a 4.5 star hotel suite with a good-sized bathroom. 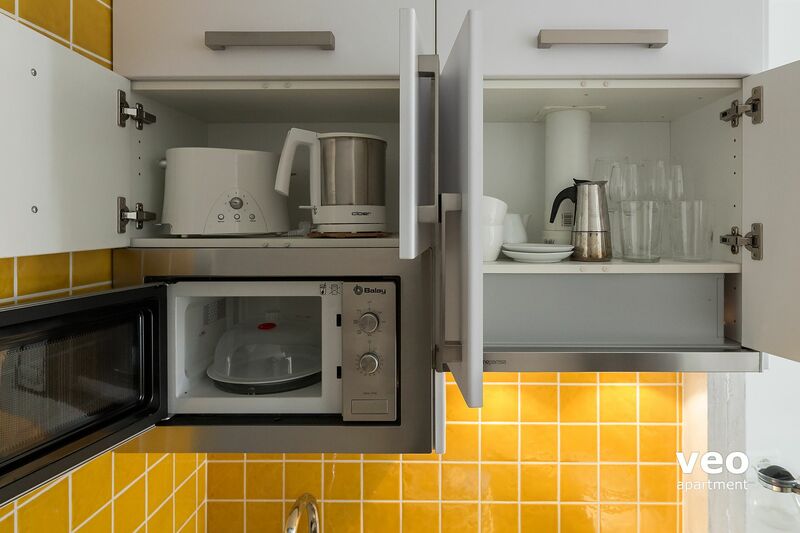 Tiny but very usable kitchenette, wish there's more counter space though. Very comfortable, very welcoming after an exhausted day of sightseeing. A bit of a walk to the nearest the bus stop and other sights, not really within walking distance. Very clean. Shared laundry facility well-arranged. Helpful office downstairs. Price very reasonable. Great for 2 persons. Feria market is great to visit.